A voucher for our one-day cheese-making course makes a fabulously different gift experience for cheese and food lovers. The course is suitable for all those interested in learning and gaining hands on experience on how cheese is made, and will cover the making of a soft fresh cheese and a hard, cheddar-style cheese. Teams of two will work together and each cheese maker will be able to take their two cheeses home to eat or to mature further. It teaches participants to make simple cheeses at home using basic home utensils with a maximum of 8 people per course. Cost of course: £160 including lunch and all cheeses. When you buy a cheese course online you will be sent a voucher which is valid for one year from date of purchase. 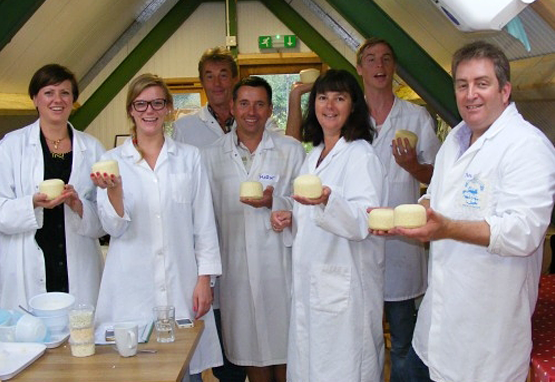 For more details of the course and upcoming dates visit our Cheese Course page.